Enables you to extend your SATA interface and provide a panel mount connector for your eSATA devices. Back by StarTech.com's lifetime warranty. Provides an eSATA panel mount connection from your SATA controller. 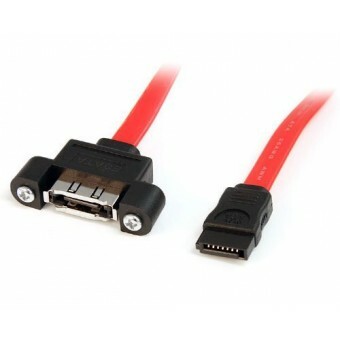 This 1-foot panel mount eSATA cable features an eSATA male connector on one end, and an eSATA panel mount (female) molded connector on the other, providing a well-secured, easy-to-access eSATA connection on any machine port or faceplate. Backed by StarTech.com's Lifetime Warranty. Enables you to extend your SATA interface and provide a panel mount connector for your eSATA devices. Back by StarTech.com's lifetime warranty. Provides an eSATA panel mount connection from your SATA controller.